The Resilience project is collecting indicators of health system activity over the last eight years. The indicators are publicly available data from a wide range of different sources. Below are some graphs using the indicators to illustrate what is happening in the health system from the available data. We also provide the data in a spread sheet here so that people can do their own analysis from the data. If using the data, we request that you credit the resilience4health.com project in the Centre for Health Policy and Management, Trinity College Dublin. We will introduce new indicators and update the data as new data become available. The health budget grew steadily in the 2000s. Despite the onset of the economic crisis in 2007 and 2008, the health budget increased in both those years and was not cut until 2009. This graph shows the increase in the health budget until 2009 and the decline in the health budget since then. This is in contrast to the growth in population, especially the growth in population over 65 years of age, who require greater levels of health and social care. The graph is indexed at 2009 and shows the change in budget and population before and after 2009. The health budget is from the annual Department of Public Expenditure and Reform’s Revised Estimates and is only inclusive of current expenditure. Up to 2013, the Department of Finance published the Revised Estimates. Since 2005, there has been a steady increase in the numbers covered by the General Medical Scheme, ie those in the population with medical cards. The significant increase reflects declining incomes and growing numbers of unemployed during this period. 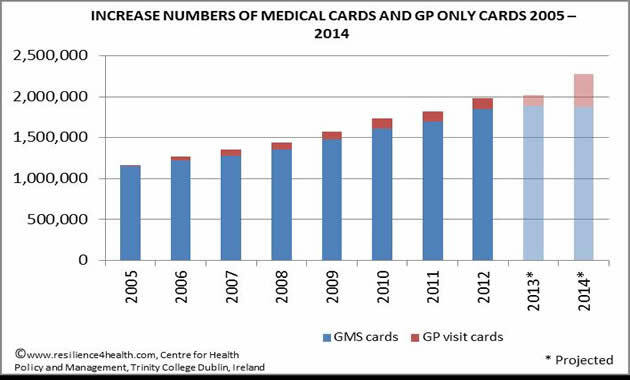 Budget 2005 announced the introduction of GP only cards, which have slowly increased since then. The 2013 figures are projected as there are not yet final figures for December 2013. The figures for 2014 are projected with a larger increase in GP only cards, reflecting the government commitment to provide free GP cards to all children under the age of six years of age during 2014. The GMS and GP only card numbers are taken from the HSE Annual reports. 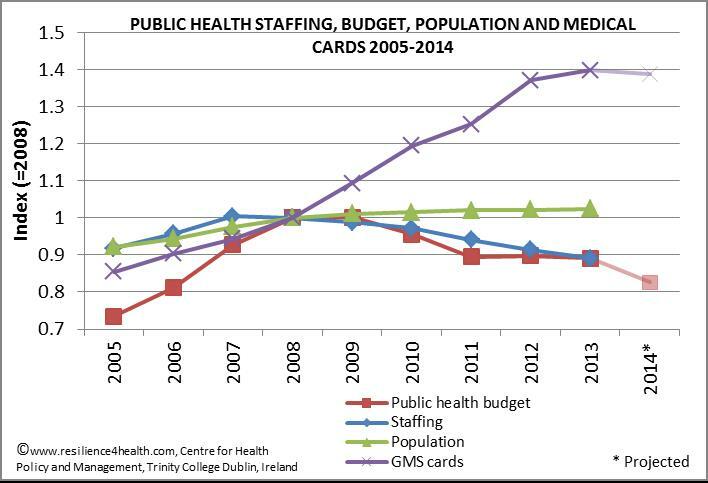 This graph shows the change in the numbers of HSE staff, the public health budget, the population growth and the numbers with medical cards, relative to their respective 2008 values. It shows a steady decline in staff and budget alongside a growth in population and significant growth in those with medical cards. The staffing figures are from the HSE Annual Report which uses figures from 31 December each year. 2013 and 2014 figures are from HSE Annual Service Plans for the same years as the annual reports are not yet published. Staffing figures for 2007 are from the 2008 HSE National Service Plan as they were omitted from the 2007 annual report. Staffing projections for 2013 and 2014 are from the 2014 HSE National Service Plan. 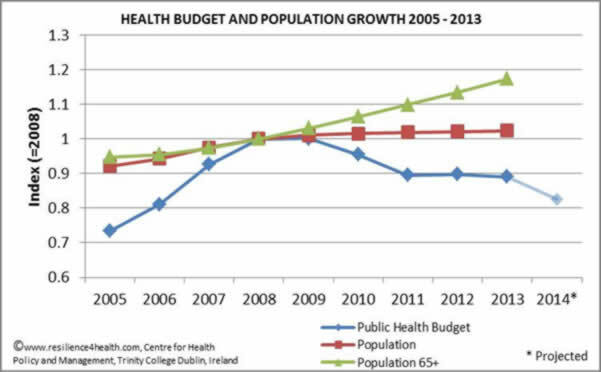 The public health budget figures are from the Department of Public Expenditure and Reform as detailed above in graph 1. The population and over 65 figures come from the CSO databank, accessed 1 June 2013. The medical card figures are taken from the HSE Annual Reports. Figures for 2013 and 2014 are from 2014 National Service Plan. 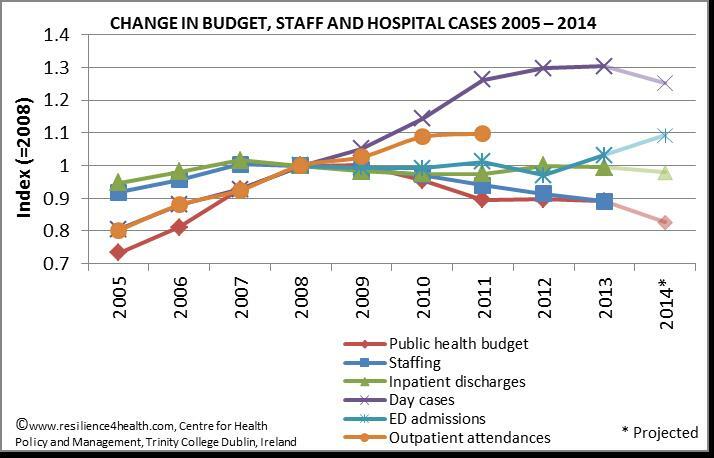 This graph shows the change in the public health budget, staffing, hospital inpatient discharges, hospital day cases, Emergency Department (ED) admissions and outpatient cases relative to their 2008 value. It shows a steady decline in staffing and budget alongside a levelling out of inpatient care, increased day cases and increased emergency care. 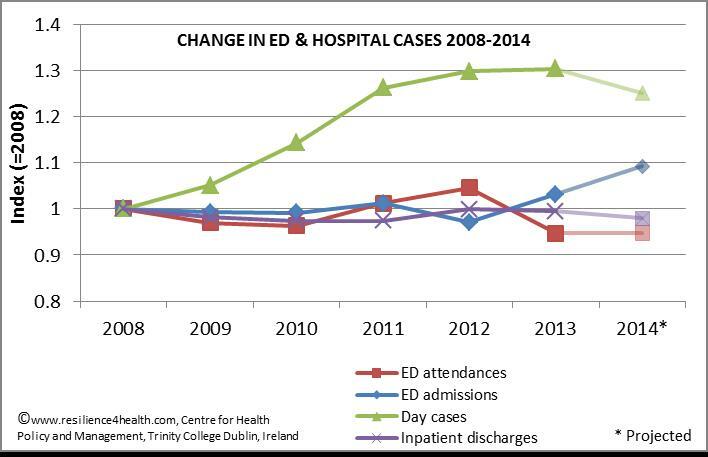 Figures for 2014 project for the first time since the establishment of the HSE a decline in day cases. They also project the only increase in hospital care during 2013 and 2014 are emergency admissions. The HSE stopped publishing time series out patient data in the annual report in 2011 but a target of 3,591,700 was set for that year. The public health budget and staffing sources are cited above. Inpatient, day cases, outpatient attendances and births are taken from the HSE Annual Reports up to 2012. Outpatient attendances were not counted from 2011 on, the 2011 figures used is a projection from 2011 HSE Service Plan. Figure after 2011 are not used as the HSE changed the way they counted outpatient attendances in 2012 so they are not comparable. Figures for 2013 and 2014 are those projected in the HSE National Service Plans. Emergency Admissions are taken from the HSE Annual Service Plans and are only available from 2008. 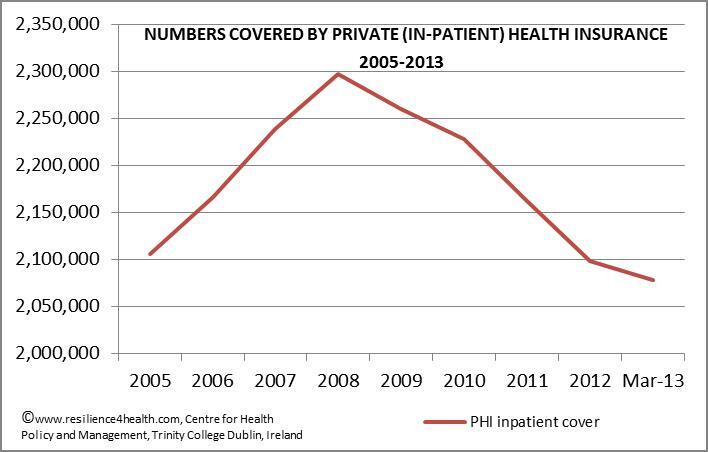 This graph shows the declining numbers covered by private health insurance from 2008 when private health insurance coverage was at its height at 51%. This reflects declining incomes and ability to afford private health insurance as well as high numbers of previously employed young people emigrating. The figures come from the Health Insurance Authority Annual reports and Market Statistics September 2013. 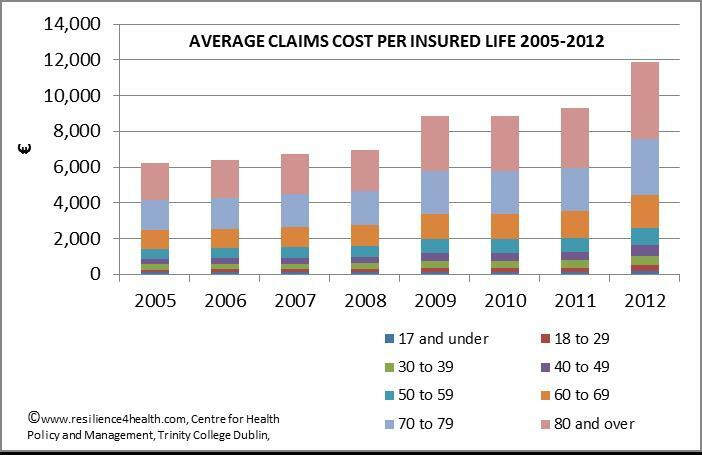 This graph shows the significant increase in the average cost per private health insurance claim since 2005, showing increased costs of claims, with significant increased costs year on year especially among older age groups. 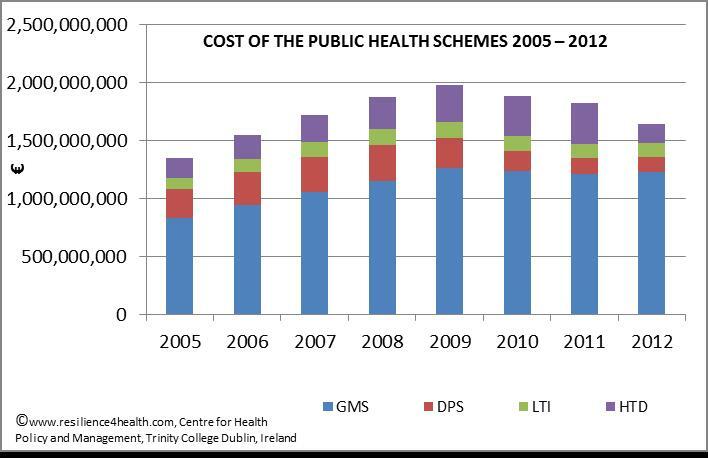 This graph shows the numbers covered by publicly funded HSE schemes - the General Medical Scheme (GMS), the Drug Payment Scheme (DPS), the Long Term Illness Scheme (LTI) and the High Tech Drug Scheme (HTD). There are increasing numbers covered by each scheme except the Drug Payment Scheme in which there has been a decline in numbers covered. This reflects the increase in the point of reimbursement. In 2007, the cost of drugs over €85 per month was reimbursed by the State, by 2013, this had risen to €144 per month, ie all those without medical cards had to pay up to €144 each month for their prescription drugs. 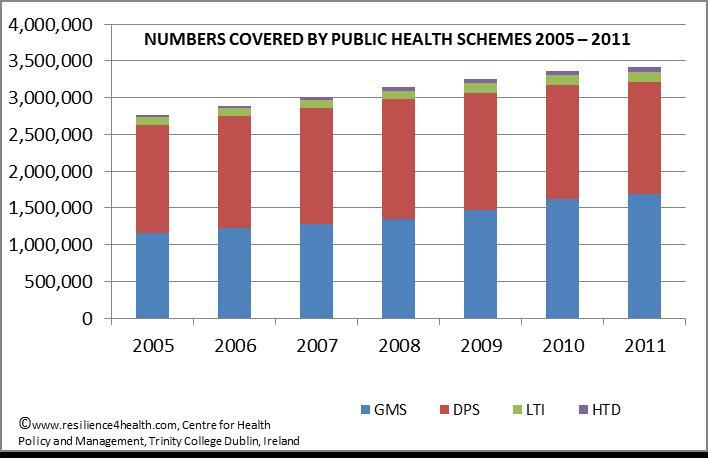 Figures are from the HSE Primary Care Reimbursement Scheme (PCRS) Annual Reports which are only available up to 2011. The 2012 HSE PCRS annual report is yet to be published. 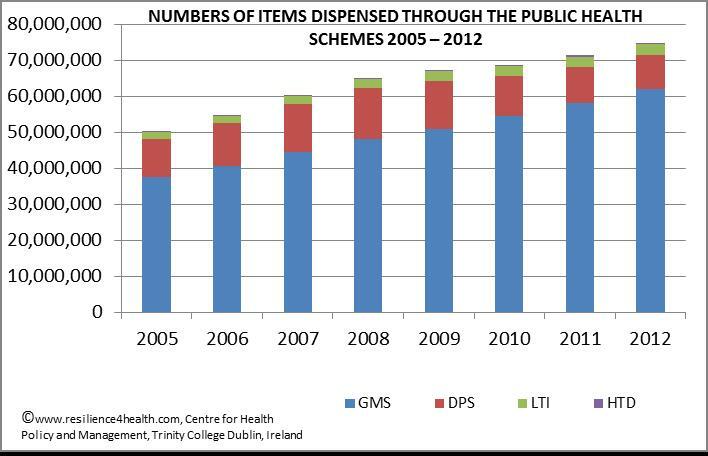 This graph shows the increase in the numbers of prescription items dispensed under the public health schemes, which have grown across all the schemes except the Drug Payment Scheme. Figures are from the HSE PCRS Annual Reports which are only available up to 2011. The 2012 figures are from the HSE Annual report. This graph shows that despite the increasing numbers covered by all the public schemes, except the DPS, the costs of the schemes have reduced. This reflects cuts in payments to contracted health professionals such as pharmacists, doctors and dentists, as well as better deals with the pharmaceutical companies which have brought down the cost of the drugs budget. 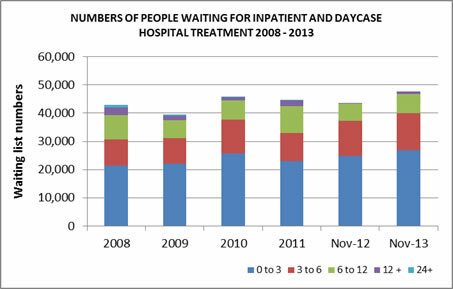 This graph shows the number of people waiting for inpatient and daycase hospital treatment. This includes all children and adults. The year 2009 shows the fewest numbers of people waiting, this was also the year when the health budget was at its highest. Some progress was made in 2011 and 2012 reflecting government priority attached to reducing waiting times and the establishment of the Special Delivery Unit. November 2012 and 2013 data is given as end of year data for 2013 is not yet available, showing a significant year on year increase, perhaps reflecting a health system that is cannot do anymore with available resources. Figures for 2008 to 2011 are taken from the HSE December Performance Report (PR) for each year, except for the 2010 figures which are taken from the January 2011 PR report as there was no PR report for December 2010 due to industrial action. The HSE PR reports use the National Treatment Purchase Fund (NTPF) Patient Treatment Register. November 2012 and November 2013 figures are taken directly from the NTPF National Treatment register. 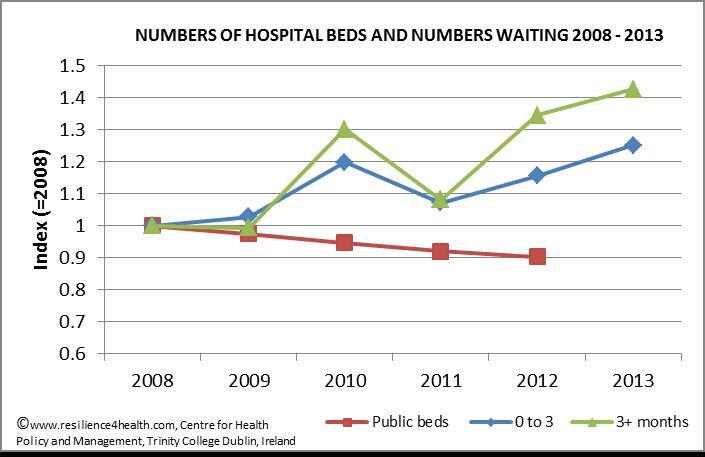 This graph is indexed at 2008 and shows the decline in the numbers of hospital beds and increases since 2011 in the numbers waiting over three months for hospital treatement. The hospital bed figures were a direct request from the HSE as they stopped publishing bed numbers in 2008. Figure are not available for 2013. The numbers waiting are taken from the Patient Treatement Register from the National Treatement Purshce Fund. Figures are not available pre 2008. This graph is indexed at 2008 and shows the trend in Emergency Department (ED) attendances, ED admissions, day cases and inpatient hospital treatments. It shows a steady increase in day cases in line with international norms and a related decline in inpatient cases. It shows a decline in ED attendances and increased ED admissions since 2012. The only hopsital activity expected to increase in 2014 are ED admissions. The sources of the hospital cases are detailed in graph 4.